Harris Zafar, a public speaker, writer and national spokesperson for the Ahmadiyya Muslim Community USA, visited Rice University hours before Donald Trump took the presidential oath of office. Speaking in front of thirty-five students in “Sociology of Religion,” a course which I guide, Zafar immediately noted the symbolic timing of his visit. There he stood, a Muslim American of Pakistani descent speaking about religious freedom to college students, just as Trump – who ran an anti-Islam and anti-immigrant campaign – sweeps into the White House. Zafar was born and bred in Portland, Oregon. He is American, through and through. He told Rice students that the United States is his home and that he does not want to live in Pakistan, a country that systematically persecutes the Ahmadi Muslim community. Zafar loves America because it provides him freedom of conscience and freedom of religion. But Zafar is also weary about the anti-Semitism, Islamophobia, and other forms of discrimination and racism around the United States. Early in his presentation, he raised concern over several current events including: the wave of bomb threats against Jewish communities, the spike in hate crimes against Muslims and Sikhs, and the proposed policies of American “leaders,” some of whom want a surveillance program to watch Muslims. According to Zafar, these developments contradict political documents like the Constitution and the Declaration of Independence, which clearly mark freedom as a fundamental American value. The question, “What does it mean to be American?”, is one of the many areas of inquiry in our Sociology of Religion course. Last week, I invited students to read several excerpts from the Harvard Pluralism Project’s website. Professor Diana Eck, a foremost scholar on religion in the United States, claims that mere religious tolerance is not enough for a religiously diverse nation such as America. 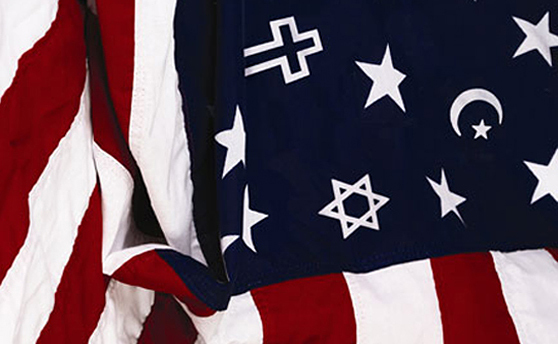 Eck encourages Americans to move beyond mere tolerance and to enter the realm of religious pluralism, or the energetic engagement with religious diversity. Religious pluralism, she notes, is not diversity alone. Religious diversity is a given, but pluralism is not a given; it is an achievement. Eck also tells us that religious pluralism is the active seeking of understanding across lines of difference, and the encounter of commitments among religious communities. Her last part of religious pluralism – dialogue – is the language of give and take as well as criticism and self-criticism among people of faith. Zafar brought all these elements of religious pluralism to the table on Trump’s inauguration day. He embodied the best of the American spirit by openly and respectfully engaging with students from different faith backgrounds. Zafar revealed his views, but he did not try to convert any single person. He recognized difference, respected it, and even embraced it. I felt like yelling – this is what it means to be American! The kind of civil exchange that Zafar had at Rice appears to be under threat in the age of Trump. The new President increasingly depicts American society as if it functions only in binary terms. During his inaugural address, he divided the world into “civilized” and “uncivilized” camps, and did so immediately after using “radical Islamic terrorism,” a loaded and controversial term that upsets many Muslims. The binary of “Muslims versus non-Muslims” or “the Muslim world versus the West” ignores various nuances, particularly the idea that people can seamlessly be both Muslim and Western. Trump claims that he will unite Americans, but by using the “us” versus “them” dichotomy, he creates walls between people. Zafar, however, breaks down walls to build bridges of understanding and hope. Religious pluralism, to him, is the best way forward. The danger in the age of Trump is that religious communities might build walls –whether real or imaginary – to keep “others” out. Ironically, building walls could not be further from the vision of the American founding fathers. George Washington welcomed Muslims and people of all faiths into “the bosom of America.” Benjamin Franklin invited the top Muslim leader of Turkey to come preach Islam in Philadelphia. John Adams called Prophet Muhammad a “sober inquirer of truth.” Thomas Jefferson studied the Quran and wrote about the importance of religious freedom for people of all faiths. To summarize – religious freedom is what makes America, America. One of the most striking moments of Zafar’s presentation occurred when he looked at religious pluralism – or lack thereof – in other parts of the world. He argued that America should not be like Iran, which cracks down on Christians; like Saudi Arabia, whose grand Mufti ordered the destruction of churches; like Pakistan, a country in which Sikhs, Sufis, Shias and Christians are regularly attacked; or like China, whose ongoing persecution of Falun Gong has been described as a crime against humanity. Zafar’s material reminded me of two things – that I am grateful to live in a country founded on freedom of religion, and that religious pluralism can serve as a kind of medicine to cure the diseases of discrimination and racism in the United States and elsewhere. I have told Rice students that America needs a new understanding of “common sense.” Thomas Pain, the philosopher of the American Revolution, coined this phrase to advocate for independence from Britain. The “common sense” of 2017 should not be viewed through the prism of taxes, representation, or sovereignty, but rather through dialogue, education, understanding, commitment and engagement within and across religious communities. This is the best way for America to stay American in the age of Trump. Why is that? Why are ahmadi persecuted in Pakistan?